Filter by an additional category5th Grade Environmental ProjectAboutAdmissionsAlumniArchiveAthleticsBuddiesCatalinaCollege AdvisingCreative ArtsElementaryENews NewsletterFeatured PostsHawk LifeHawk NewsHigh SchoolIn the NewsIndiaLearning JourneysMiddle SchoolOut and AboutPerforming ArtsPre/KRamayanaScholarshipsService LearningService Learning OpportunitiesSouth AfricaSupportThe ConnectionValuesWashington D.C.
Posted on: October 27, 2018 Categorized: About, Alumni, Athletics, Buddies, Catalina, College Advising, Creative Arts, Cross Country, Elementary, Featured Posts, Hawk Life, Hawk News, High School, HS Basketball, HS Volleyball, In the News, Learning Journeys, Middle School, MS Volleyball, Performing Arts, Pre/K, Ramayana, The Connection, Track and Field, Values, Washington D.C. 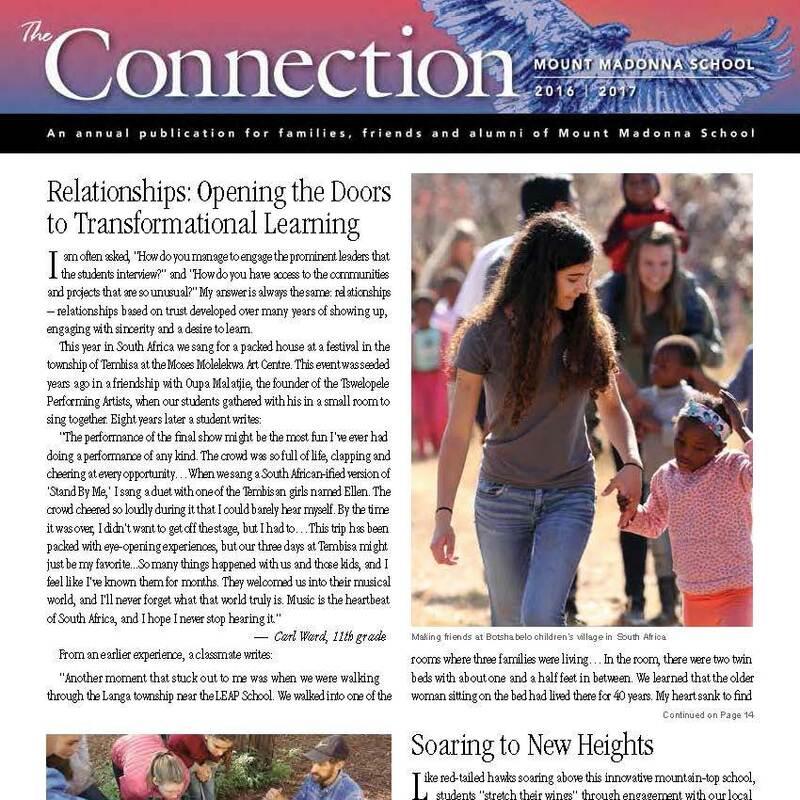 The Connection, 2017-18, an annual publication for families, friends and alumni of Mount Madonna School. Click on the image to load and view the content in a ‘page-turning’ format or download the PDF. The Connection, 2016-17, an annual publication for families, friends and alumni of Mount Madonna School. Click on the above image to load and view the content in a ‘page-turning’ format or download the PDF. The Connection, 2015-16, an annual publication for families, friends and alumni of Mount Madonna School. Click on the above image to load and view the content in a ‘page-turning’ format or download the PDF. 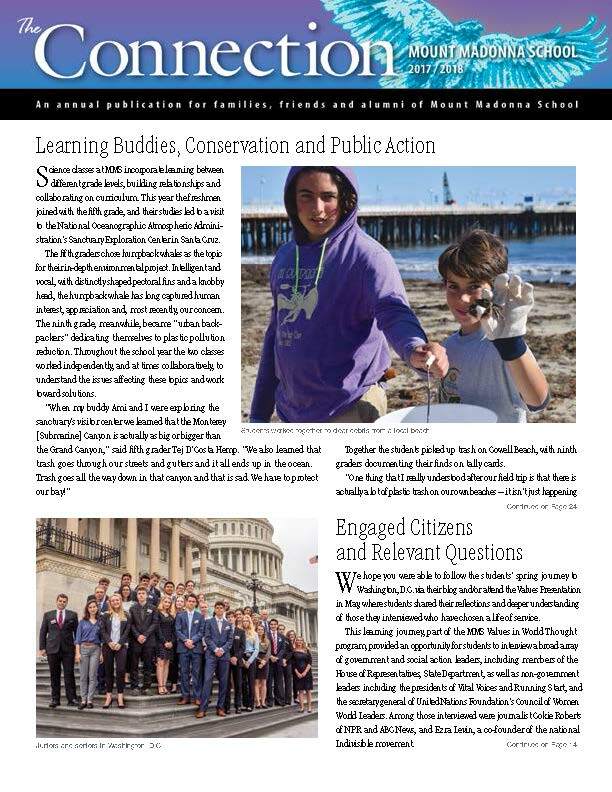 The Connection , 2014-15, an annual publication for families, friends and alumni of Mount Madonna School. The Connection , 2013-14, an annual publication for famiiies, friends and alumni of Mount Madonna School. The Connection, 2012-13, an annual publication for families, friends and alumni of Mount Madonna School. 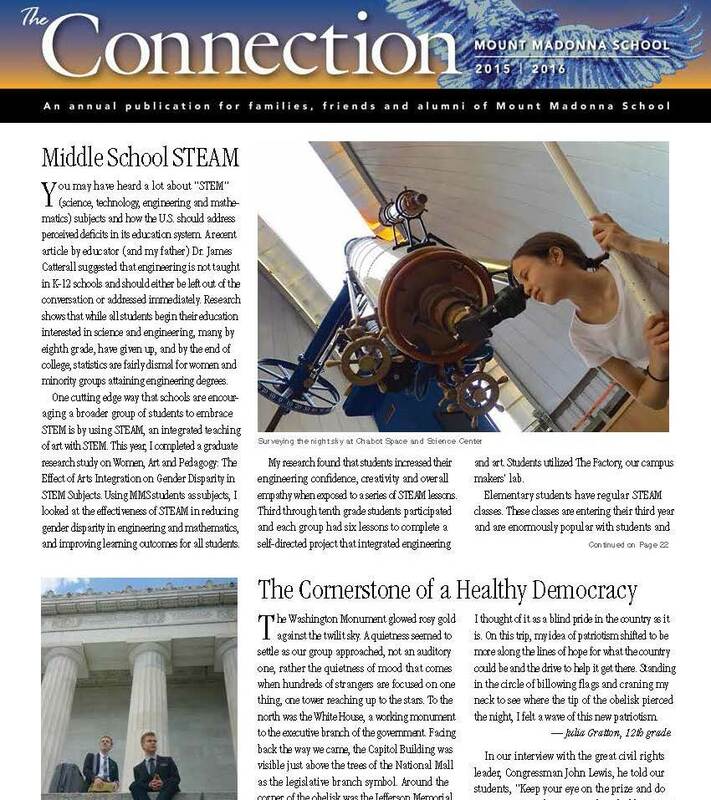 The Connection, Summer/Fall 2012 edition, an annual publication for families, friends and alumni of Mount Madonna School. The Connection, Summer/Fall 2011 edtion, an annual publication for families, friends and alumni of Mount Madonna School.